For a century, a common idiom for saying “No way” or “You couldn’t pay me enough” referenced the tremendous amount of tea drank in China and its value. But, the world’s biggest coffee company is making such inroads that the thought of tea as the common beverage is changing somewhat. Starbucks’ plans to open their first Starbucks Roastery and Reserve Tasting Room international location and so many stores in China that the phrase ‘not for all the tea in China’ may be passé. The firm opened its first Starbucks Roastery and Reserve Tasting Room, which is essentially a high-end coffee “temple” where devotees can enjoy every aspect of coffee and rare blends, in Seattle two years ago. The concept includes roasting, manufacturing, education as well as a retail coffee bar and restaurant within one facility. Last month, they announced plans to open one in New York City. On Thursday, the company announced that it would be opening its first international Roastery and Tasting Room in China, specifically Shanghai, next year as part of their plans to expand considerably in that country. The Shanghai site will be a 30,000 square-foot coffee palace located in one of the world’s busiest shopping districts. The massive site will be twice the size of the original and 50 percent largest than the Manhattan one, but will offer a similar, immersive coffee gourmand sensory experience. The company promises an interactive environment that will enable visitors to learn about the roasting and brewing craft and drink a wide variety of Starbucks coffees including rare, circumscribed availability options from throughout the globe. “China represents the most important and exciting opportunity ahead of us. As our first international Roastery, we will take even bolder steps to make this Shanghai location our most stunning store, while making it completely unique and relevant to the Chinese customer,” commented the company’s chairman and CEO Howard Schultz. 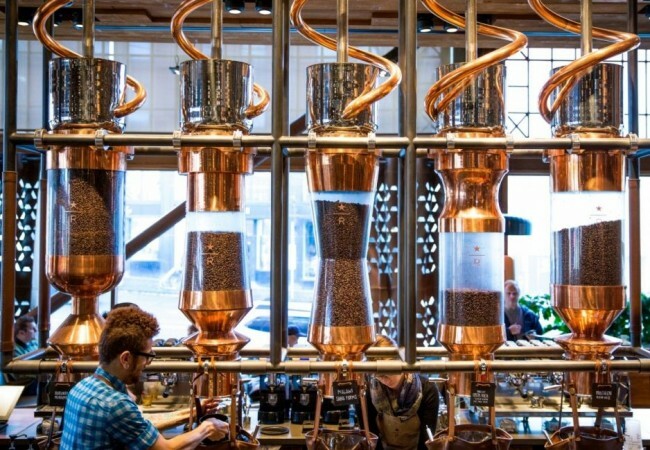 “The Starbucks Roastery environment honors coffee innovation as a modern day Willy Wonka experience, where customers are only feet away from the theatre and artistry of our coffee craft,” he boasted adding that he is confident that the Shanghai site’s debut is sure to be one of Starbucks’ most highly anticipated retail location openings. The new Roastery will not be the only must-see Starbucks location in Shanghai. The company is opening what they hope will be the highest grossing store worldwide by the entrance of the Shanghai Disneyland opening next month. “We’ve been so successful in China over many years and we’re just starting to get the morning-day part — where we’re educating local Chinese to drink coffee in the morning,” Schulz added. With its behemoth Roastery and plans to open more outlets, Starbucks would like to retire the phrase ‘Not for all the tea in China’ or replace it with something else, such as coffee.